Ryan Says His Budget Would Balance In 10 Years : The Two-Way While "opponents will shout austerity," the Republican lawmaker says his plan would still let federal spending grow. It just wouldn't grow as quickly as now projected, he says, and would come into balance if the economy continues to expand and boosts federal revenue. Rep. Paul Ryan, R-Wis., when he was campaigning as the 2012 Republican vice presidential nominee. Ryan's previous proposal, he said, would balance the budget in 20 years. How has he cut 10 years off that time? The "fiscal cliff" deal reached as 2012 turned into 2013 "raises $600 billion in tax revenue over the next decade," Tamara reported, "and Ryan is including that in his new budget." "Otherwise," she added, "Ryan has telegraphed that his new plan will include many of the same cuts as past GOP budgets, most notably it would convert Medicare into a premium support program." On the op/ed pages of The Wall Street Journal today, Ryan makes his case for the new plan. "Our opponents will shout austerity, but let's put this in perspective. On the current path, we'll spend $46 trillion over the next 10 years. Under our proposal, we'll spend $41 trillion. On the current path, spending will increase by 5% each year. Under our proposal, it will increase by 3.4%. Because the U.S. economy will grow faster than spending, the budget will balance by 2023, and debt held by the public will drop to just over half the size of the economy." President Obama and his fellow Democrats, of course, have other ideas about how to get the federal government books in order. Politico this morning looks at the president's new efforts to reach out to some Republicans in order to cut a deal. It concludes though, that "the expectations for both a sustainable civil alliance and a grand bargain remain low for one very simple reason: The parties are further apart on taxes and entitlements than they were in 2011 when Obama and House Speaker John Boehner (R-Ohio) first entered into talks and came close to striking the ever-elusive grand bargain." Update at 11:20 a.m. ET. White House Says Ryan's Math "Just Doesn't Add Up." "The president has put forward a balanced approach to deficit reduction with no sacred cows. It includes more Medicare savings over the next decade than the House Republican budget, but it does so by cracking down on waste and fraud, not by asking middle class seniors to bear the burden. It closes tax loopholes for the wealthiest and biggest corporations so we can still afford to create jobs by investing in education, manufacturing, infrastructure, and small businesses. The President's plan puts our nation on a fiscally sustainable path and grows our economy from the middle class out. "While the president disagrees with the House Republican approach, we all agree we need to leave a better future for our children. The President will continue to work with Republicans and Democrats in Congress to grow the economy and cut the deficit in a balanced way. This is the approach the American people overwhelmingly support, and that is what the president will continue to fight for each day." Ryan is holding a news conference this hour. A reporter noted that he's pitched a similar budget plan before — one that focuses on cuts in projected spending and eschews tax increases — and in the time since then was on the losing presidential ticket. Should losing an election mean "we surrender our principles?" Ryan asks. That Republicans should "stop believing in what we believe in?" "We think we owe the country a balanced budget," he says, and "solutions" to the nation's problems. 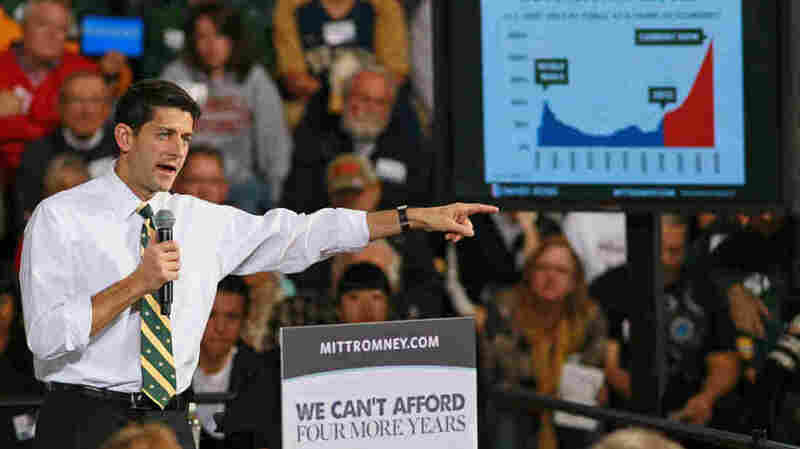 Ryan's "Path to Prosperity; a Responsible, Balanced Budget," plan is now out. As Tamara notes, "it calls for the repeal of the president's healthcare law, and approval of the controversial Keystone XL Pipeline. It would cut growth in programs for the poor by turning them over to the states. And for future seniors, it would convert Medicare into a premium support program."